President Thomas Jefferson appointed the Corps of Discovery and named Meriwether Lewis as its leader. The Lewis and Clark Expedition was part of a larger movement of colonization of the United States territory called Westward Expansion. 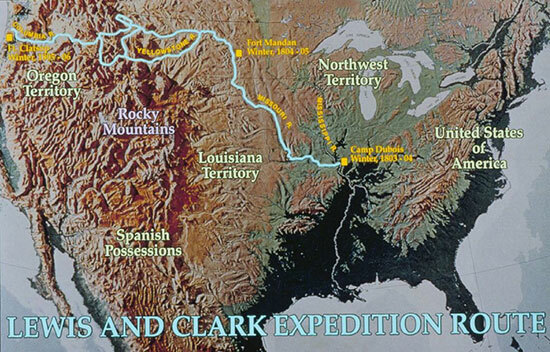 Map of the Lewis and Clark Expedition Route in the Lewis and Clark Slide Program. Courtesy of the National Park Service. 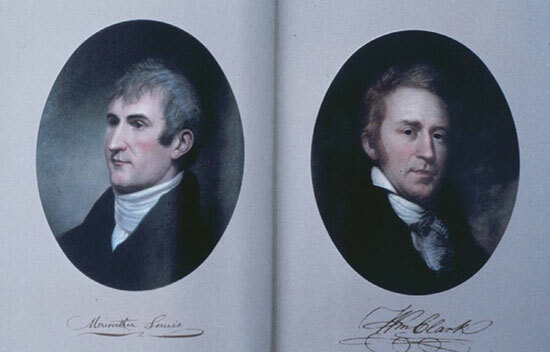 Paintings of Lewis and Clark in the Lewis and Clark Slide Program. Courtesy of the National Park Service. Was to reflect the broad range of Jefferson's interests. The expedition was meant to prepare the way for the extension of the American fur trade and to advance geographical knowledge. The President provided the best supplies, clothing, firearms, equipment, and rations then available. Lewis and Clark were instructed to observe and record the entire range of natural history and ethnology of the areas they explored. They were also to note possible resources which would support future settlement. The Louisiana Purchase of 1803 had doubled the size of the nation, but a good share of the territory the expedition would explore was unmapped. Jefferson envisioned the nation's eventual expansion to the Pacific and desired to strengthen the American claim to the Northwest Columbia Basin. They "discovered" beauty beyond their wildest expectations and the people they encountered represented nearly 50 indigenous tribes that enabled the successful completion of their mission. And even though an easy water route across the continent was not found, the geography, flora, fauna and other natural phenomena they documented resulted in a large body of scientific information that was new to the Western world. These accomplishments made the Lewis and Clark Expedition one of the most successful explorations of all time. Lewis and Clark in canoes meeting the Indians. Courtesy of the National Park Service. William Clark established "Camp River Dubois" in December 1803 at the junction of the Mississippi and Missouri Rivers, north of St. Louis. Clark recruited and trained men, while Lewis spent time in St. Louis, conferring with traders about the Upper Missouri regions and obtaining maps made by earlier explorers. On May 14, 1804, William Clark joined Meriwether Lewis in St. Charles, Missouri. The Corps of Discovery numbered over 45 and included 27 young, unmarried soldiers, a French-Indian interpreter, and Clark's Black slave York. An additional group of men called engagés who were French-Canadians employed to canoe in the fur trade--usually indentured servants--would travel only to the Mandan country for the first winter, and these included six soldiers and several French boatmen. Travel up the Missouri River was difficult due to its strong current and many snags. The explorers suffered from heat exhaustion and disease along with encounters with animals and insects. The expedition used a specially built keelboat and two smaller boats, called pirogues which average around 15 miles per day to carry their supplies and equipment. During this phase, the group suffered the only casualty of the expedition, Sgt. Charles Floyd. It is believed that Floyd died of a burst appendix and they buried him in modern day Sioux City, Iowa. The relations between The Corps of Discovery and Native Americans were generally good, and councils were held with the Otos and Missouris. Lewis and Clark would give peace medals to the most important chiefs of each tribe. 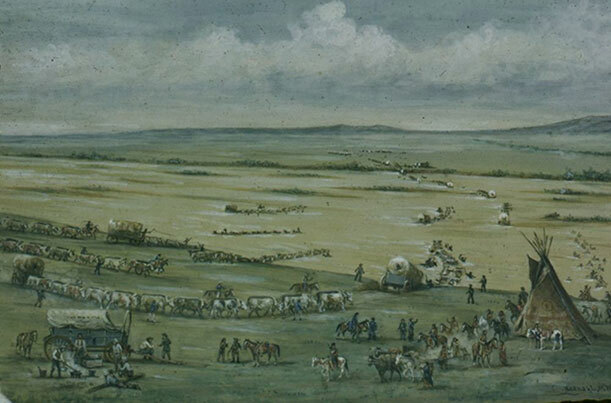 By October the Corps of Discovery reached the Mandan and Hidatsa villages, where they built "Fort Mandan" (near present-day Washburn, North Dakota), and spent the winter season of 1804-1805. During this time Lewis and Clark made numerous notes in their journals, drew maps, and learned the geography of the land from Native Americans. They recruited an interpreter named Toussaint Charbonneau, who brought along his Shoshoni Indian wife, Sacagawea, and her newborn baby boy, Jean Baptiste. After the winter of 1805 on April 7, Lewis and Clark sent back a wide-ranging collection of zoological, botanical, and ethnological specimens as well as letters and all reports of their journey so far. They continued their westward journey in two pirogues and six dugout canoes. The Corps of Discovery size is now 33 and now have traveled into regions which had been explored and seen only by Native Americans. After crossing most of modern-day Montana they were held up for over a month by the extensive waterfalls at Great Falls. Lewis tried to use a special collapsible boat he had manufactured at Harpers Ferry, but the animal skins could not be sealed over the boat's iron frame and it had to be abandoned. August 17 they reached the navigable limits of the Missouri River near the Rocky Mountains and turned south up the Jefferson River. The voyage crossed the Continental Divide through Lemhi Pass and there they purchased horses from the Shoshonis with the help of Sacagawea. While they traveled north to Lolo Pass this became the most difficult part of the journey as they crossed the Bitterroot Range on the Lolo Trail. Surviving on modest supplied of dried foods and low on provisions. Lewis and Clark reached the country of the Nez Perce on the Clearwater River in Idaho and left their horses for dugout canoes. From there they floated down the Clearwater, Snake, and Columbia rivers, reaching the Pacific Ocean by November of 1805. In December The Corps of Discovery built Fort Clatsop on the south side of the Columbia River and settled in for the winter. Despite troubling insects and constant rainfall, Lewis and Clark accomplished considerable scientific work while on the Pacific coast. There they gathered and recorded information about the terrain and its inhabitants. The return trip began on March 23, 1806. 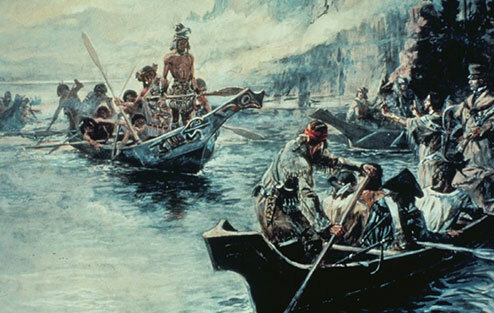 The journey up the Columbia against strong currents was a tough experience, the party retrieved their horses from the Nez Perce and waited for the deep mountain snow to melt. When they crossed the Bitterroots the party split at the Lolo Pass to add to the geographical knowledge they would gather. Confident of their survival, Lewis went north while Clark went south. During the expedition, there was only one violent incident of the entire journey and it happened on the Marias River were Lewis’ group had a skirmish with the Blackfeet Indians. When they reunited in North Dakota, at the mouth of the Yellowstone River. They left Charbonneau, Sacagawea and the baby at the Mandan villages, continued down the Missouri River and arrived in St. Louis on September 23, 1806. The accomplishments of the Lewis and Clark Expedition were extensive. It altered the imperial struggle for the control of North America, particularity in the Pacific Northwest. It strengthened the U.S. claim to the areas now known as the states of Oregon and Washington. Lewis and Clark achieved an impressive record of peaceful cooperation with the natives and generated American interest in the fur trade. This had a far-reaching effect, leading to further exploration and commercial exploitation of the West. Lewis and Clark added to geographic knowledge by determining the true course of the Upper Missouri and its major tributaries. They might have destroyed the dream of a Northwest Passage but proved the success of the westward travel to the Pacific. They compiled the first general survey of life and material culture of the Native American tribes of North America. Lewis and Clark's expedition added significant knowledge of the zoological and botanical of the continent, providing the first descriptions of many new species of animals, including the grizzly bear, prairie dog, pronghorn antelope, and mountain goat. They made the first attempt to successfully attempted to determine the latitude and longitude of significant geographical points. In less than 2 1/2 years, at a total cost to the taxpayer of $40,000, The Corps of Discovery traveled over 8,000 miles. The Lewis and Clark Expedition was phenomenally successful in terms of accomplishing its stated goals, expanding America's knowledge, and tantalizing curiosity and wonder about the vast American West. The most important trails of The Lewis and Clark Expedition are represented on the map below. 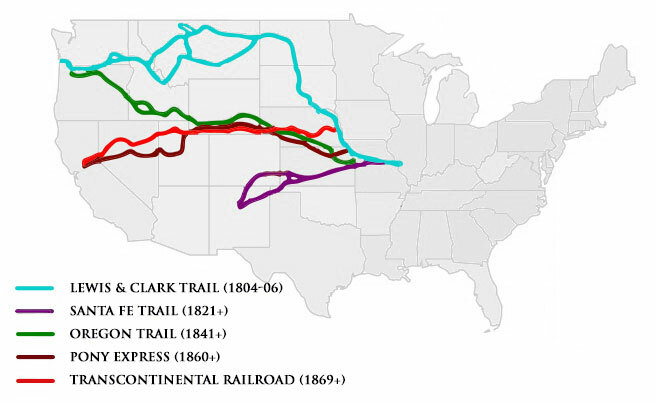 Map of the Westward Expansion trails. Wagon train crossing the plains. Courtesy of the National Park Service.